HESCH HISTORY: Were there passenger ships arriving in Duluth? Were there passenger ships arriving in Duluth? I've been checking the DULUTH HARBOR CAMS lately cuz it's fun to see big ships glide into the canal and give a one-long-and-two-short blast on the horn that says "I'm HERE! ", and the answering one-long-and-two-short from the bridge that says "Welcome!". Click the link, and open the Canal one. You'll see the view from the Marine Museum roof, looking east, out to the lake. Then, if you close that and open the Bridge cam, it's the opposite direction from the same roof, looking toward the harbor itself. Got that? 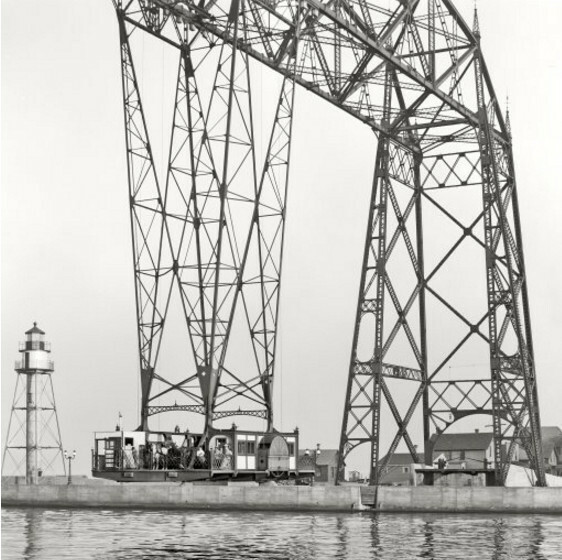 The Duluth ship canal, sans bridge, in 1898. Something more than a ferry across the canal was needed, as Minnesota Point (now Park Point) was becoming more populated with businesses and homes. Plus, people were buying cars. 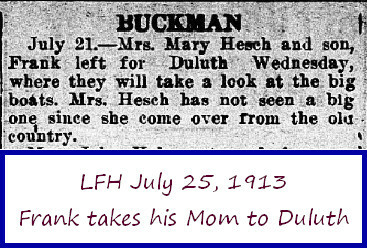 Here it is in 1910, with the solution pictured right below, the way Frank and his mom would have seen it. This was a suspended ferry of sorts. The platform could hold 120,000 pounds, including people, horses, wagons and street cars. The trip across took about a minute, and was efficient at leaving room for boats to enter. HERE'S A BETTER PHOTO. I really hope Frank and his mom took a ride, just for fun. So, you say, what makes me think that there were any passenger ships during that time? Well, if you've clicked links above, you know some of the photos are from a website called Shorpy.com | History in HD is a vintage photo blog featuring thousands of high-definition images from the 1850s to 1950s. Another picture I found there was of the Lake Steamer North Land docked in Buffalo, NY, on it's way to Chicago and Duluth. Hooray! 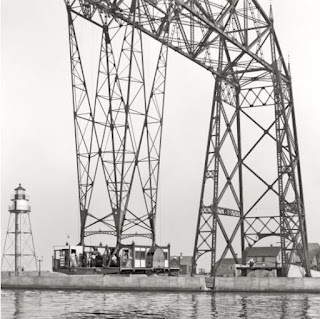 BTW, the Duluth ship canal lift bridge as we know it was re-fitted in 1929-1930 so the deck rises out of the way of passing ships, and lowers again for vehicular traffic.